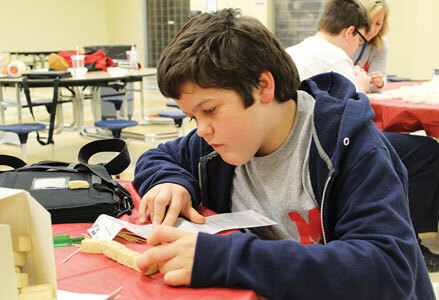 Eighth grader Jonah Brake is pictured building a structure out of blocks with help from his instructor, Brandy Spurgeon, as part of an activity for the Bunsold After School Enrichment (BASE) program. The program is aimed at providing math and tutoring to students as well as host activities that promote topics anywhere from STEM to entrepreneurship. Brake joined the program this year after his mother discovered it, and made a new friend. Spurgeon said after the students construct their creations, they will write a short story about it. Bunsold Middle School is bringing back an after-school program to bolster math and English skills. The middle school reintroduced its Bunsold After School Enrichment (BASE) program to students in October for another five years, picking up from where it left off from 2012 to 2017. It teaches students topics anywhere from STEM to entrepreneurship while improving math and English skills with tutoring. She said some students have already expressed a desire to learn robotics, yoga, photography, self defense and even pingpong. She said the program will try to weave math and English skills into each activity. Spurgeon said BASE also caters to promoting emotional wellbeing rather than just academics. “Some kids may not necessarily need the academic part, but they may need the social-emotional part,” Spurgeon said. BASE program director Kelly Walker said a challenge her team wants to tackle this time is finding a way to recruit students. Walker said Spurgeon’s efforts to learn what the students enjoy is helping. Walker said Spurgeon’s efforts will help keep students in the program. She said Spurgeon has also been working with administrators to connect other educators with BASE. “If we’re all on the same page, we can all help improve,” Spurgeon said. Walker noted the program is funded by a 21st Century Grant that requires students commit to attending BASE at least 30 days during the school year. She said the program will be flexible for students in sports or other extracurricular activities, as they don’t have to attend the full session time. If the students can’t make the full time commitment, Walker said their parents can pay a fee to keep them in the program. Mike White, Marysville School District’s director of business services, said another challenge is not just getting students interested, but their parents as well. He said it’s easy for a student stay after school for the program because they’re already at school when it starts, but it’s a problem for some to get reliable transportation when BASE concludes. He noted some parents may be too tired or running errands to pick up their children from BASE. “Do you see your kids growing and their social skills improving? All of those things a parent wants from their child? Then they have the initiative to get their kid back and forth,” White said. Walker said the grant funds supplies, services from outside instructors and companies, technology and professional development for its staff. She said this involves teaching the Inventionland curriculum to Bunsold educators so they can instruct students about STEM-related activities. White said another goal for the program is to make sure it’s sustainable beyond the next five years by encouraging business and community leaders to get involved. He said their help will go toward funding more activities for students, as well as getting professionals from various fields to teach students about their line of work. Eighth grader Jonah Brake said BASE provided him an opportunity to do something after schooland meet new people. BASE is available to all Bunsold students, from 2:40 p.m. to 6 p.m., Monday through Thursday every week, unless specified otherwise. Parents are also invited to the program’s monthly advisory committee meetings to give ideas on what topics the program should teach students. The next one will be held Dec. 18. Walker also encourages business and community leaders and professionals to volunteer their time to teach students about their trade or industry.